Cork, 12 April 2017: It’s difficult to keep up with ever-changing technology trends, new apps and social media. While young people are natural users of technology, parents and guardians often find it harder to stay abreast of the latest tech trends and how to use them. 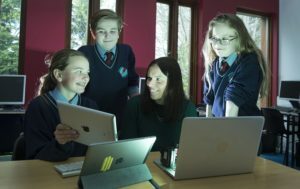 Cork’s Technology Network, the CEIA, have come up with a new programme, Mentor-A-Parent, which will see young people coaching parents on every day technology from SnapChat to security among other key online skills. The Mentor-a-Parent programme is already being piloted at Gaelcholáiste Charraig Uí Leighin, and will roll out across Cork in September 2017. “Technology is part of our every day lives and yet children are using it in very different ways to adults. We felt it was vitally important for parents and guardians to be better equipped with online skills, from using apps to being able to manage their network security and wifi at home, to SnapChat and other social media channels. And who better than young people to provide this type of training!” said Valerie Cowman, Skills & Education Chairperson of the CEIA. The Mentor-A-Parent programme is a novel and valuable way in which parents can equip themselves with the knowledge to discuss technology with their children, and to be a pro-technology household that is safe and secure online. For young people, the tech coaching empowers them through the training to showcase how they use technology, and why they chose certain applications of technology, particularly through smartphones and devices. The CEIA are keen to promote the use of technology, which is vitally important for all ages, and yet to ensure through the Mentor-A-Parent programme that technology should not be intimidating but instead good fun for everyone. 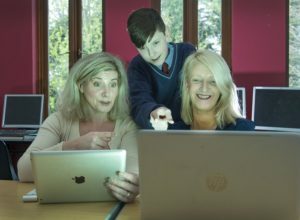 “Embracing technology as a learning tool is central to we do at Gaelcholáiste Charraig Uí Leighin. As we guide our students’ learning towards key skills such as communication, creativity, and the ability to manage information, we are excited about the potential of CEIA’s Mentor-A-Parent programme. This highly innovative programme, which has received a hugely positive response at the Gaelcholáiste, affords parents and guardians an opportunity to learn from their children, while students benefit greatly from guiding the learning,” said Áine-Máire Ní Fhaoláin, Principal / Príomhoide at Gaelcholáiste Charraig Uí Leighin.